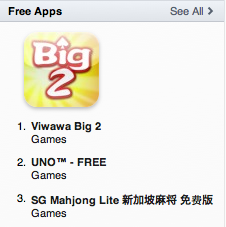 Our Viwawa Big2 App for iPhone®/iPod touch® is currently the top free app for all Card games in the Singapore App Store! If you have an iPhone® and have not downloaded it yet, what are you waiting for? It's FREE!